When writing a comment with a lot of formatting, especially one containing formulas, I often found myself pasting it into the "new answer" editor at the bottom of the page to see if everything was rendering properly. But this is kind of tedious. So, I've written a userscript that creates a new live preview directly beneath any comment you compose or edit. This script has made writing such comments a much nicer experience for me so I hope others enjoy it as well. It works on all Stack Exchange sites (as far as I know) but I wrote it with Math SE in mind. 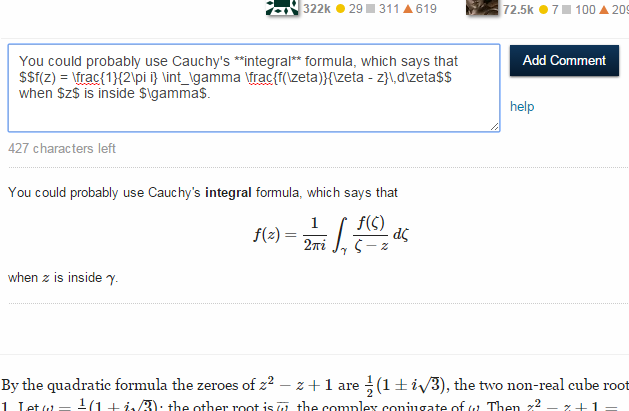 MathJax is rendered in the new preview just like when you're writing an answer, if a little more slowly. More information can be found in the StackApps post for this script. Even more can be found on its GitHub page, including a list of known issues. Browse other questions tagged discussion mathjax comment markdown user-scripts . Why doesn't [link description](URL) work for me in the comments? How are **bold** and *italics* presented in comments?